My heart is pounding out of my chest, my cheeks are getting red, my body starts to feel hot and clammy, I hear the words forming in my head,"This is what I want you to do". No, no that couldn't be God speaking to me?.... that's just my imagination, God doesn't really want me to do that? Do you ever go through these same feelings? So many times I give in to fear and worry about what others think more then about what God thinks. I give in to what I want instead of what God wants. I know I have missed out on so much, because instead of choosing to listen to God's voice, I listen to the lies of Satan and allow myself to make excuses and justify my actions. Satan doesn't want us to accomplish anything for Christ, so of course he lies to us and tries to convince us we didn't really hear God's voice. It might just be giving someone and encouraging word, asking for forgiveness, sharing the truth, praying for someone, going somewhere I don't want to go or stepping out of my comfort zone in an area in my life. When I start to hear the Holy Spirit speaking to me, impressing his truth in my heart, I hate to admit it but I usually start trying to talk myself out of it. I know its sad, I am just a big, fat, coward! I don't want to do what comes hard for me and I care way too much about what other people think. They probably are not even thinking about me but I think they are, so I think up all these things in my head that I think they are thinking about me. Yeah, its pretty twisted. I have found though.... that I am not alone! In fact most of the people I talk to go through the same thing; you might be one of them, even those I have thought to be so bold and obedient. The truth is we all deal with fear. My fears might be different then yours but none the less they are real to us. When I was younger I was very shy,( or at least that is what my parents told me) I would tremble at the thought of having to talk to someone I didn't know or ask a stranger a question or talk in front of a group of people. It might sound silly but these fears were very real to me. It wasn't till I was forced to get out of my comfort zone that I found it easier and easier to speak up. It took practice, it didn't come naturally to me. As I have gotten older I still find my self at times at a loss for words, fearing how I am going to keep a conversation going( usually because I don't think I have anything interesting to say.) But now I find myself doing things I never thought I would be able to do and I actually enjoy them!... because I have asked God to take me out of my comfort zone. When he does, sometimes I wonder why I prayed that prayer because he takes me further then I usually want to go, but looking back,I have no regrets! When I feel God prompting me to do something I am not comfortable with, all these excuses come floating up to the surface of my thoughts and try to crowd out the truth: I am not outgoing, I am not qualified, I am not going to explain the truth properly, I am going to look stupid, someone else could do it better..... I can relate to Moses a lot. "Moses said to the Lord, "O Lord, I have never been eloquent, neither in the past nor since you have spoken to your servant. I am slow of speech and slow of tongue." He has clearly spoken to me many times through this passage. He has called me, yes me! And if He has told me to do something, who I am to tell him differently? He made me, he knows me, he knows my weaknesses and my strengths and yet I have the nerve to question him about his choices?! He knows what he is doing. He revealed to me that if I am not obedient I will miss out and he will find somebody else to take my place, but I was originally his first choice. Its not easy, believe me, but when I choose to be obedient to his leading and his word, He empowers me to do what I can't and fills me up with what I am lacking. And he gets all the glory, because it sure wasn't me!! For some reason God likes taking those of us who most would say are not qualified and proving them wrong! Actually he delights in it! I am sure you have heard it before, but God doesn't choose us for our abilities but our availability. Almost everything that God has called me to do I have felt inadequate and unqualified for, but when I have chosen to listen to him and not my own opinion or the voices in my head, I have been so glad I did! I would have never experienced the joy of seeing his power take over in my weakness, I would never have grown out of some of my insecurities and gained new strengths and I would probably still be shaking in my boots at the thought of the unknown. After I have finally silenced the lies and stepped out of my comfortable little world, I look back and wonder how I could have been so afraid?!. Recently God put it on my heart to do something that I did NOT want to do. It required me humbling myself and admitting my shortcomings and failures. Believe me I was not chomping at the bit to do this. Who of us really wants to rake up things that we have done in the past? Nope, not me! But he continually kept confirming his word to me and the thought would not go away try as I might to forget about it. One evening I was reminded of it and knew I just had to do it. So I went and did it before I had time to talk my self out of it. I felt that heart pounding again but I felt his presence come over me and push out the fears. I knew I was doing the right thing. Once I had finished my task I felt so relieved and thankful that I had determined in my heart to do it. Even if the outcome doesn't turn out how I expect or I don't see the end result, I know I was obedient and didn't let fear get the best of me! There is nothing worse then that sinking feeling you get when you choose to ignore God's voice. Fear is crippling not only for yourself but for your relationships. God wants to bring healing and restoration but he can't if we are unwilling to humble ourselves and submit ourselves to his will and yes, step out by faith into the unknown. When we understand who we are in Christ and how much he loves us; we can do things we never thought possible, because it is his love that enables us. If you have had something that you know God has put in your heart to do, don't put it off any longer, even if it has been years since you first heard that still small voice. God does not leave you to do it alone, he is with you. The longer you put off what God is speaking to you to do, the harder it will be! Even if you don't understand why; he sees the future and we can't. We can trust him! Thomas Jefferson got it right.... "Never put off tomorrow what you can do today!" Nike is not to far behind with their slogan..."Just do it!" No matter what we think others think of us or what we think, we can KNOW that Jesus loves us and has chosen us! We don't need to be bound by fear any longer!! 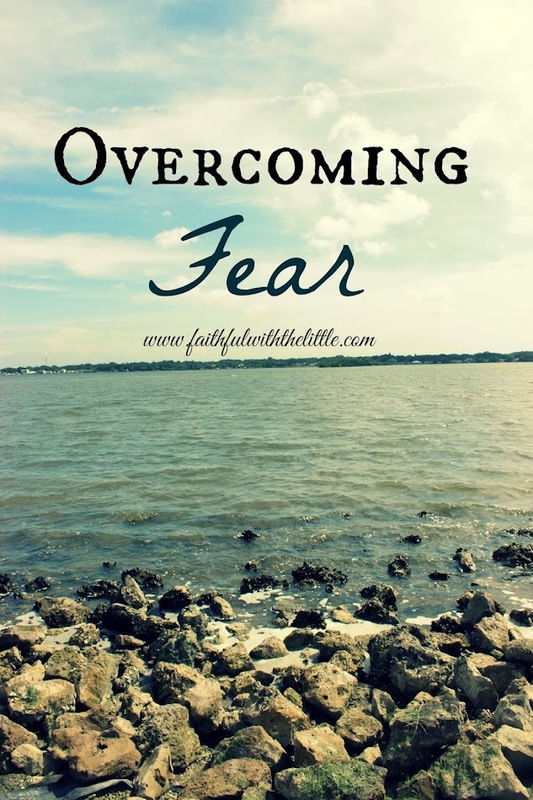 Are you living in fear? If Jesus is alive within you, you don't have to! When we experience his love for us, it sets us free to obey his commands and overcome this world! He would never call us to do anything that he would not enable us to do if we truly love him and believe in him. Yes, there will be times when fear will rear its ugly head up, but we don't have to be held captive by it! LOVE this! Yes, I have had those heart pounding moments- times when I knew he was speaking and either obeyed, or didn't, when He was calling me to the Rock that was higher than I. I, too, praise God that He has taken me out of my comfort zone in life and made me someone I never thought I could be! And I praise God for His humbling hand that guides us and desires the best for us. Thanks for sharing and for your encouragement! You are a blessing! Thanks katie! its so true, he does want the best for us! I am daily learning to trust and obey. I could have written every word here. I have felt the same way! I over-analize everything to death! Even the things that I feel God leading me to do to comfort others I may fear that they will be offended somehow. I'm finally learning to release my fears and obey God. This is an awesome post! Rebekah, your blog could have written for me. I too struggle with fear and insecurity. I wonder if I got it right or if my efforts are enough. Sometimes I think God paints us in a corner so we have to trust and depend on Him alone. Not on ourselves, on Him alone. He always comes through and enlarges what we give. Bless you, hope you have a good week! Thank you for sharing such an insightful blog posts filled with Scripture proofs of how to walk in obedience when God calls us to something that strikes fear in us. I read a quote last week that said "all fear begins in the mind". The Lord gives us a Scripture antidote for this, " We demolish arguments and every pretension that sets itself up against the knowledge of God, and we take captive every thought to make it obedient to Christ"
I love this. The longer you put off what God is saying to you, the harder it will be-- probably to hear Him again. i add that from my own experience. I am very critical and analytical. I analyze and sometimes criticize everything. And that almost robbed me from hearing God. Because I will first of sit to analyze everything He said... the why's the how's before I think of obeying. I'm learning to be less critical when it comes to the things of God. What a blessing to have the examples of followers who have gone before us. Countless men and women throughout Scripture who said, "Not me, Lord." And God used them. So often I think it's about me, when in reality He is more than able. I just want to be obedient and in the vicinity trusting His goodness and grace. Great post! I'm visiting from Missional Women. Blessings to you!